All stakeholders in the pavement community-from owner agencies to designers, and from material suppliers to contractors and consultants-are embracing the need to adopt more sustainable practices in all aspects of their work, and are continually seeking the latest technical information and guidance available to help improve those practices. 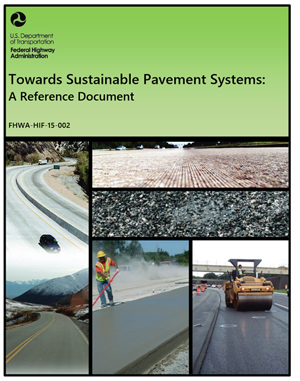 This reference document has been prepared to provide guidance to the pavement community on sustainability considerations in pavement systems, drawing from and synthesizing the large and diverse body of knowledge that exists on pavement sustainability. As such, it provides the currently available knowledge and information for designing, constructing, and maintaining pavement structures more sustainably, and has been structured so that it can adapt to new findings and new information as sustainability considerations continue to develop and evolve. Key information is presented on pavement sustainability concepts, sustainable materials for paving applications, design of sustainable pavements, sustainable pavement construction practices, use phase considerations, sustainable maintenance and preservation practices, sustainable end-of-life considerations, pavement sustainability and livable communities, and assessing pavement sustainability. It is important to recognize that there is no universal definition of a "sustainable" pavement. Sustainability is very much context sensitive in that each project is unique, with specific needs depending on the location, climate, available materials, facility type, and required level of service, as well as on the overall goals of the organization. In essence, sustainability is very much a system characteristic, and pavements represent but one small part of the transportation infrastructure system; consequently, any improvements to the sustainability characteristics of pavement systems cannot be done in isolation from the transportation infrastructure system or from other systems with which pavements interact.